Think of it this way: You may drive an old Buick for years, but once you sit in the cockpit of a Mercedes, you know what true luxury feels like. The difference between an office chair that’s adequate and an office chair that frees a worker to be more productive is like the difference between driving that Buick and piloting a Benz. Let’s take a look back to understand why. From the first craftsman making do with a rough wooden stool to Julius Caesar, who reportedly took his throne-like curule chair everywhere he went, human beings have sought the perfect “work” chair. Early art shows us that even ancient people thought about seating design – chairs that would make it easier for workers to weave cloth, chisel stone, or piece together chain mail. As the Industrial Revolution changed the lives of workers, designers began conceptualizing furniture with productivity in mind. By the late 1800s, chairs could swivel, roll, or tilt. Charles Darwin famously added wheels to his office chair to get around his work space quickly. Other adjustable features allowed barber’s chairs, for instance, to be raised or lowered. In short, furniture makers began to design the functionality that we see in modern offices today. The basic principles behind ergonomics, the science of maximizing comfort and support at work, have been around for quite some time. Developments during the second world war brought these ideas to the forefront, as researchers set out to improve a pilot’s performance in the cockpit of a B-29 Bomber. It didn’t take long for designers to realize that the same fundamentals used to improve military performance could be used to improve productivity in the modern office, too. The golden age of mid-century design brought American GIs back to work in style. However, it took until the 1970s for ergonomics to become fashionable and widespread. For the first time, designers began to think beyond productivity and aesthetics to the health and well-being of each and every worker. As computer work and cubicles took over in the 80s and 90s, it was clear that something better was required for employees who spent most of their lives in front of a computer. Aeron® Chair by Herman Miller® has a reputation for comfort and style. Herman Miller revolutionized ergonomic seating with the Aeron Chair in 1994. Designed by Bill Stumpf and Dan Chadwick, the Aeron is still one of the most iconic and popular ergonomic office chairs on the market. You know that feeling of lying in a hammock on a warm summer day? The Aeron is constructed of mesh material rather than standard upholstery. This proprietary material distributes weight, conforming to the human body, so users feel suspended in the chair. It hits zero pressure points, which means that an employee can sit for long periods of time in comfort. The Aeron takes up less visual and physical space than other office chairs. In a sense, it’s like the chair isn’t even there. 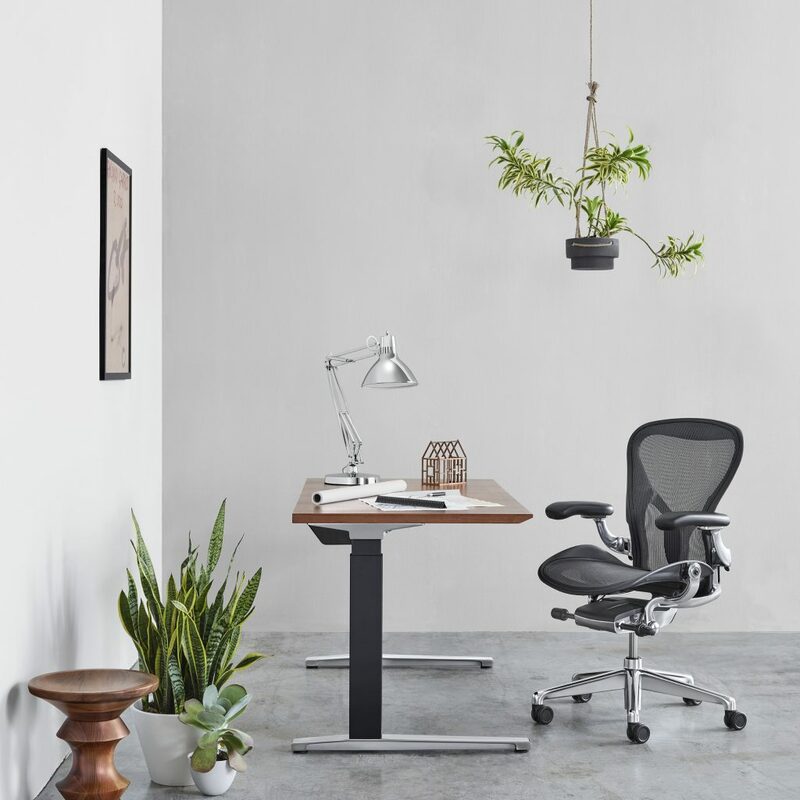 Office Designs offers the iconic Aeron along with other products that have built on Herman Miller’s first achievement of ergonomic design. Trust us: You’ll be impressed by the range of ergonomic choices available today. 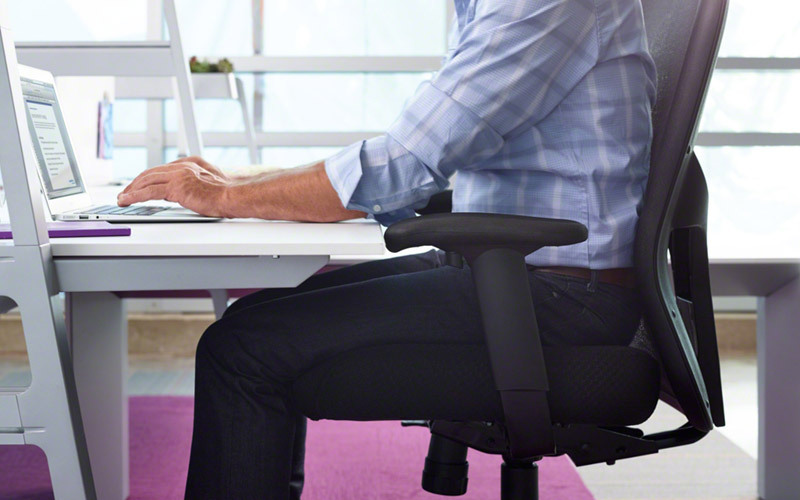 The Embody® Chair by Herman Miller® supports healthy movement effortlessly. One is Herman Miller’s Embody Chair. Providing more active support than the airy Aeron, the Embody is constructed of flexible plastic that moves with and contours to the user’s back. Employees can adjust the chair along the entire length of the spine, hitting those lumbar sweet spots. 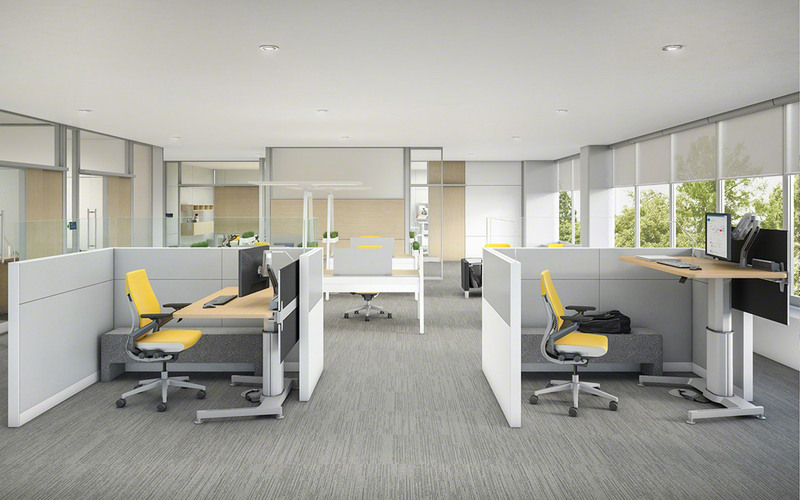 Other chairs that are popular among executives seeking true quality are the Steelcase Leap & Gesture Chairs. 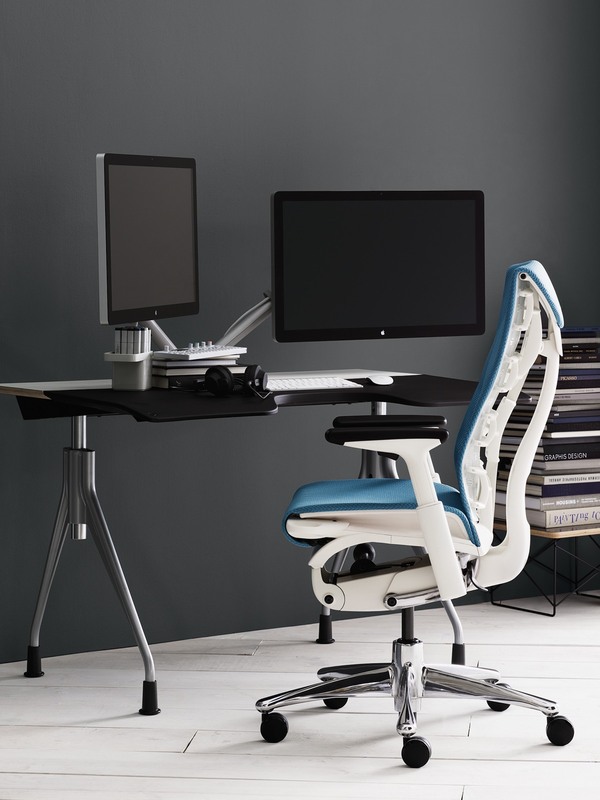 The Leap may look like a traditional office chair, but it’s not. This product flexes dynamically with the body, actually changing shape to support regular movement. By gliding with the motions of a user’s arms and spine, this chair offers continual support. The Gesture Chair has similar ribboning in the back and also moves with the user. The difference is in the arms of this chair, which allow for great versatility and flexibility. Workers at risk for developing carpal tunnel issues appreciate the kind of arm and wrist support this chair provides. Today, employers understand the value that ergonomic support can provide to their workers. They’re making that investment, not for the short-term, but for the long-term health of their entire staff. With years of experience and knowledge on a range of products, our representatives can make that timeless search for ergonomic seating easy. Be honest: You’d rather be a Julius Caesar than a peasant hunched over a laptop, right? The perfect office chair is out there. How can we help take the hard work out of your search? If you’d like more information about our products, or if you’d like to learn about financing through Office Designs, contact us at 888-498-7133. We’re here to help.